Unlike my grand-aunt Aida, Ruth and I crossed paths in this life. Despite the fact that she was one generation higher than Aida, she lived a very long life. I met her a few years before her death, in the late seventies. Sadly, I was so young, I do not remember her. But I share her name (Ruth is one of my middle names) and have always felt a deep connection to her. Ruth was the daughter of Norwegian immigrants who settled in Minnesota in the late 1800's. She was the middle of three children, with a brother above her and a sister below. Like me, she was the quiet, introverted sister, and like me, she worshipped her gregarious, outgoing, vivacious little sister. My great-grandmother Ruth's little sister married and gave birth to my grandfather by the time she was 20 years old. Ruth was still single at this point, watching both her siblings build families, waiting, no doubt, to build her own. For me, in the 21st century, watching my younger siblings reach major life goals ahead of me wasn't so bad - it's not something that's considered unusual anymore. But back then, in the early 20th century, I can only imagine how much she must have stood out, single and childless, long after her siblings had created their own families. 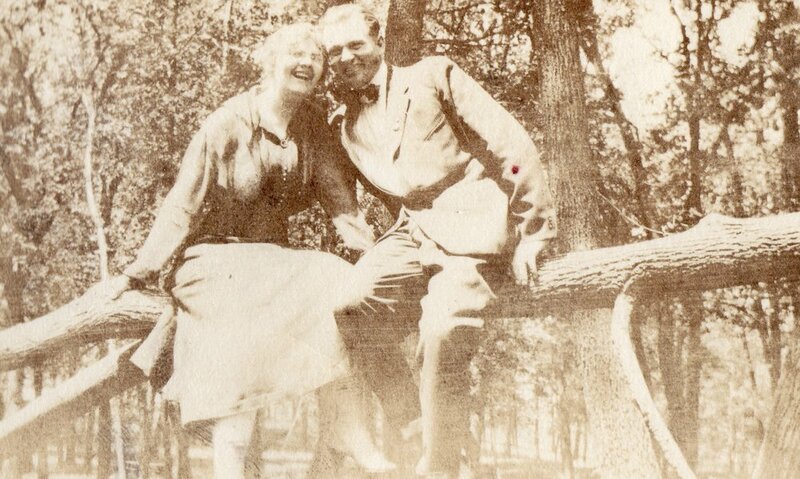 Ruth fell deeply in love in her late twenties and "finally" married at the age of 27 - spinsterhood in 1919. From the stories I heard, she adored her husband - and he adored her right back. All the family spoke of their relationship and what a deep companionship the two forged. Unfortunately, Ruth still found herself childless well into her marriage. Motherhood did not seem to be within her reach…until one day, she found out she was pregnant, and as the story goes, she was overjoyed to finally have the chance to become a mother. What came next is heartbreaking: Ruth's baby was born still. It was a little girl who never took a breath outside the womb. While I remember hearing many stories about Ruth, I heard very little about this horrifying experience - how it happened, why it happened, what happened after. I don't know anything about it except the baby's name: Dorothy. I can only imagine that Ruth and her husband were devastated by the experience. She never had another child. Were they plagued with infertility? Did they stop trying? I don't know the answer to these questions, but I have been told that their marriage was strengthened by this tragedy, which isn't always the case. Ruth and her husband stuck together through thick and thin. My grandfather loved his aunt dearly. His father was not much a part of his life, and as such, Ruth became like a second parent to him, taking care of him when her sister was busy. She might not have had her own children, but she loved the children in her life as much as any mother would. Ruth's husband died after a good, long life, leaving her on her own. One of the things I admire so much about my great-grand-aunt is that she persevered for many, many years, all by herself, after his death. She lived alone in Minneapolis and took care of herself, keeping in touch with all her nieces and nephews and their offspring, like a loving mother hen. She outlived both her brother and her sister, and became a surrogate mother, of sorts, to all their descendants. She was an amazing, brave woman with a heart of gold, and I'm so proud to be her great-grand-niece. As with Aida, it's so important to me to keep her memory alive. As a descendant three generations below her, and as the only one in my family to have met her, I realize I might be the last one to tell her story. Her bravery inspires me every time I think of her. She was so willing to surrender to the life that was given to her, even though it bucked tradition and didn't give her what she had hoped for. She still put one foot in front of the other each and every day and freely gifted others with her motherly love. If I find that I share her destiny - to be childless - I hope that I can be as generous and brave as she was. I discovered her in my 20’s when I was working on my family tree. She was my grandfather’s sister. I had heard a little about her during my childhood. She had died young, in her early twenties, and by the time I was that age, and found myself looking at a photograph of her, I couldn’t stop thinking about her legacy. She had never married or had children. Who, I wondered, would remember her? Who would keep her memory alive? Even at that young age, I remember fearing such a fate. If you are a woman who doesn’t have children, who will remember you? Who are you and what does your life mean if you leave no descendants, or if your descendants leave this earth before you do? And twenty years later, I find myself facing those very same questions all over again, as a woman who did not have children (by circumstance, not by choice). Even in my youth, I recognized how important it is to remember the women who came before us. But now I realize why. Our ancestors, mothers or not, leave an impact on their family members – cousins, sisters, nieces. Aida might not have had her own children, and might have died long before I ever had the chance to know her, but as my grand-aunt, she is still part of my DNA. And it’s important to me to remember her and share her story. Like me, she was the eldest of four children (though unlike her, I have two older half-siblings, as well). Also similar to my family, the older two children were girls, the younger two, boys. Aida, my grandfather, and their siblings were born in Copenhagen, Denmark. They spoke Danish and English, and a smattering of French and Latin. All four of the siblings were fierce kayakers. They loved to be in the water. They came from a long line of Scandinavian intellects, philosophers, and craftsmen. That is, I’m sorry to say, most of what I know of Aida. My grandfather didn’t share much about his family when I was little – and I was probably too young to have appreciated (or retained) what he did tell me. Any other information I have beyond this is based only on my intuition. I have a feeling Aida was a bit of a loner – perhaps her health problems set her apart from others. I believe she loved her siblings, and most especially, her sister, but that she never felt like she truly belonged. And most of all, I believe she loved life, and didn’t want to leave it so soon. I suspect it pained her, in the end, to face leaving her family, knowing they would go on to live full lives while she would never realize her dreams. Aida was the only one in the family who never left Denmark. She was buried there. 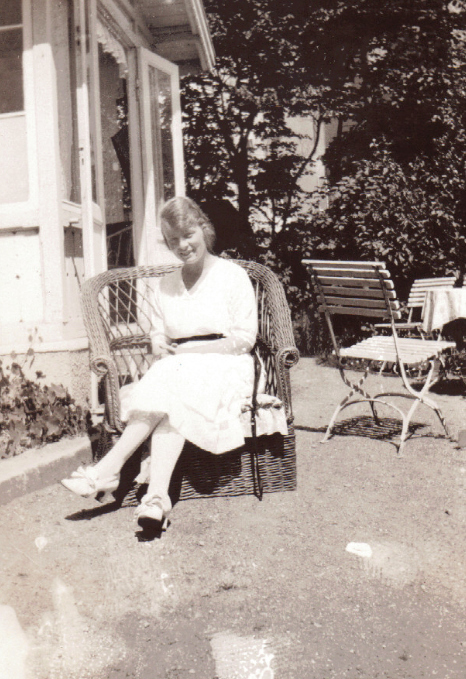 Soon after her death, the entire family – Grandpa, his remaining siblings, and his parents – gave up their lives in Denmark and immigrated to New York. None of them, to my knowledge, ever returned to their homeland. What happened to Aida seems so brutally unfair - to die so young, without the chance to experience love, motherhood, life. I have an especially deep compassion for women who have lost the chance at motherhood – in any way that might have happened. For some, it might be the death of their child. For others, infertility or other circumstances. And for some, like Aida, it might be their own early death. It’s so important to tell the stories of the unheard women. We don’t have the voices of our daughters to echo our story to the world. But these stories need to be told. We need to be remembered, too. To that end, I dedicated The Fox at the Door to two of my "great-aunts": Grand-aunt Aida, and Great-grand-aunt, Ruth. I will be the daughter they did not have, making sure their legacy lives on. I will share their story, and even join hands with them, as a fellow childless woman. Now it’s your turn. Please leave a comment sharing the story of a childless relative (or friend) that you want the world to remember.